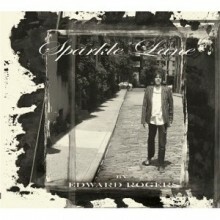 Edward Rogers impressed quite a few people with his last solo record You Haven’t Been Where I’ve Been back in 2008. Thanks to his combination of British pop/rock and folk/blues/psychedelic rock Rogers’ music had plenty of memorable moments and he has continued this on his new release Sparkle Lane. This time around it seems as though more of an emphasis has been placed on instrumentation that really grabs listeners and makes each song distinguishable from the last, and the result is another strong release from a singer/songwriter that more people should be aware of. There are still plenty of songs that follow the traditional rock mold and incorporate elements of pop and blues/folk but what really makes Sparkle Lane stand out the most are the tracks that encompass several of these genres at once and use a wide variety of instruments. Rogers clearly has a very capable band backing him up and they really shine on songs such as “Last of the Artful Dodgers” and “Whatever You’ve Been Told”. On these particular tracks there are some orchestral sounding moments that add a lot of atmosphere to the album and enhance Rogers’ introspective lyrics. While his past two albums had good songs, it seems as though Edward Rogers and his band took a step back and thought of ways to not only add more variety but to also make each song really stand out. I have always been impressed by Rogers as a songwriter and this continues to hold true on Sparkle Lane. This album definitely has a lot of depth, as it seems as though he has written very introspective songs that discuss various elements of his past. But despite the fact that the effort seems very personal a lot of the stories that he tells are relatable and that will help the album’s appeal. It also helps that Rogers has a great voice that is very pleasing to the ear. While his voice seems to be just a little higher than it was throughout much of You Haven’t Been Where I’ve Been this isn’t a bad thing as it gives the material a lot of melody. Sparkle Lane is an impressive release and finds Edward Rogers continuing to get better and better as both a singer and a songwriter. Whether you’ve heard his prior efforts or not if you enjoy folk or pop rock consider giving this album a shot as it has plenty of memorable moments. Rogers may have started later than many of his peers, but he is definitely writing better material than quite a few of them.